I had such fun yesterday at Great Brook State Park, working on the four paintings of the pond and pines. I chose four to create one per season. Since the pines are not much affected by the season, working at the park makes sense even though it's not quite spring yet, and it's just so much fun to be outside! 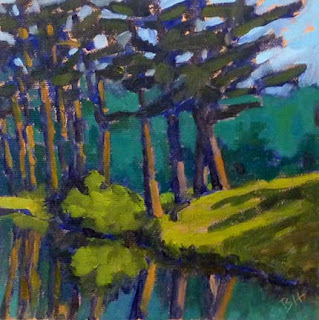 Maris Platais suggested that I not only tone the canvases (my normal process), but do a value study in the tone color. 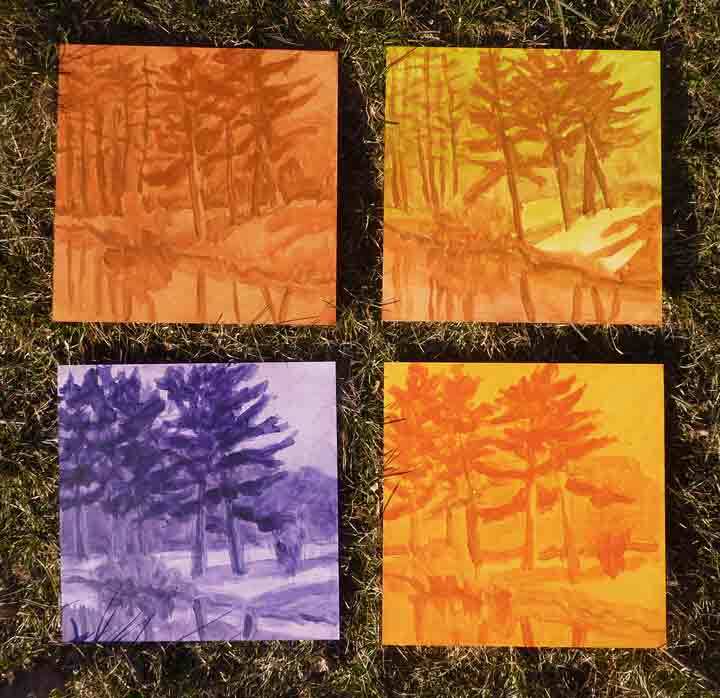 He also suggested purple for the fall painting, to pop the fall colors and bring a smoky-ness to the background. I would not have thought of that. Since I was looking for something that would dry quickly so that I can move on to the final paintings in oil, I decided to do the under-painting in acrylics. (For those who aren't into mixing media, it's fine to paint oil over acrylic, but not the other way.) 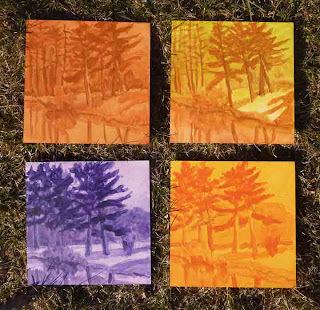 The first step was to tone each canvas, and working with acrylics outside, this meant cleaning the palette after each canvas, the paint was drying very quickly. Then I did a simple charcoal drawing to fix the basic positions before I started drawing with the acrylic paint (the bottom photo). And finally I moved my tripod between two positions about 30 feet apart to paint the four value studies with more acrylic paint (the top image). It's a good thing there's a nice bathroom with a couple of sinks at the park, with all that brush washing. Now that I've showed you the process, I do hope I'll be successful with the oil painting part! 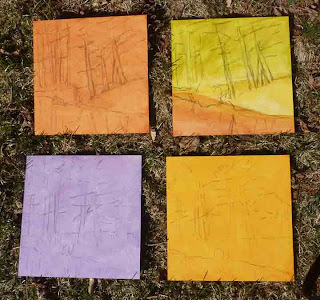 I'm starting to work on a group of four paintings of the pond and trees at Great Brook State Park in Carlisle, MA. I visited the park a number of times this winter observing the snow and taking photos. It's a cross country ski area in winter, so I had to wear snow shoes to get where I needed to go! 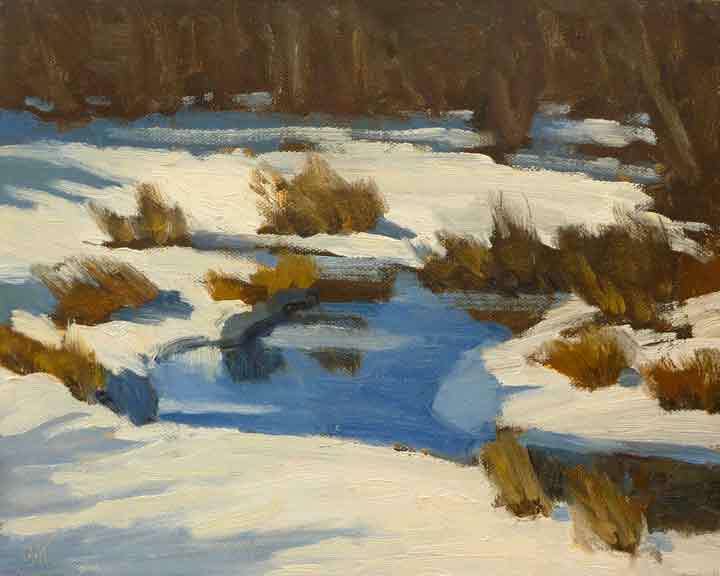 I'll be out tomorrow working on the new paintings, taking advantage of what should be a beautiful and warm day. A few years ago I did a couple of paintings of the scene from different vantage points, and thought I could use them as the starting point. And I wanted to try the winter painting as a nocturne. What better way to give it a shot than to use the summer painting as a starting point, and ArtRage to try out my ideas for the winter version? You can see the results above, after a little experimentation. It works pretty well, don't you think? Yesterday four of us got together for a mini-workshop with Carolyn Walton, for more about Carolyn, checkout the previous post. It was great fun, with some excellent demos and plenty of one-on-one instruction. I started with a photo I'd taken a few weeks ago, while balancing on a snow pile by the side of the road. I usually start snow paintings on an un-tinted canvas, but for this one I used a panel that was lightly tinted yellow/brown. I'm pleased with the results and appreciative of what I learned from Carolyn. I'll take a look at this scene again when we have some spring colors in the landscape. 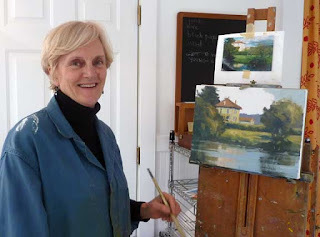 Meet Carolyn Walton, who paints from her home on the coast of Maine. I've known Carolyn for a couple of years, but don't get to paint with her very often, because there's a bit of a trek between us. 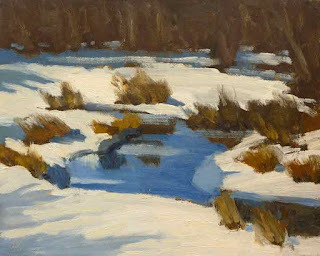 Carolyn paints primarily in oils, capturing the landscape and architecture of the Northeast and Europe. Inspired by the rural landscape, she is well-known for her interpretation of hay bales, farmland and the coast. 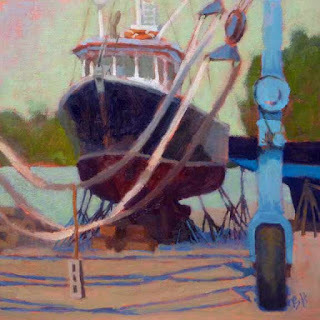 She paints en plein air and in her studio, working on larger oil paintings, as well as pastels and gouaches. One day, I'd like to take one of her week long workshops. Do visit Carolyn's website, and if you are on the east coast, one of the galleries that represent her. You'll see some very fine paintings. I mentioned in an earlier post that I'd like to periodically introduce you to artists that I meet on my travels. I'm working on a reorganization my blog layout to make it easier to find those posts, and also posts about specific workshops that I've attended, in the hope of spreading the word about these wonderful artists. Normally I paint plein air, and do my best to finish each painting on site. But sometimes it just doesn't happen. So I'm on a kick to finish up those that I think deserve it. "Boatyard" was started last June at the Royal River Boatyard in Yarmouth, where we keep our sailboat. I loved the view of the fishing boat with the slings of the travel lift in front of it. I plan to put it in an upcoming show at Yarmouth Frame and Gallery.